Combines GABA and vitamin B3. Anticonvulsant, sedative and anxiolytic effects at a cellular level. 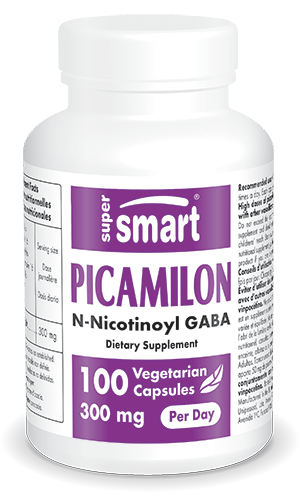 Picamilon is a tranquillising supplement that combines the effects of gamma-aminobutyric acid (GABA) and niacin (vitamin B3). Widely-studied, these two molecules are known to play a role in regulating many of the body’s functions, including excitation of the central nervous system. Hence the efforts of Russian scientists to combine them in order to offer an effective solution against stress and anxiety. Producing encouraging results, their research has led to the development of a new molecule called N-nicotinoyl-GABA. Better known as picamilon, pycamilon or pikamilon, this innovative molecule is well-known in Russia, where it is available as a prescription drug for certain types of stress and anxiety. While certain everyday situations require the excitation of neurons, the ability to modulate such excitation is vital. Over-excitation of neurons can have damaging effects in the long-term, causing high blood pressure and impairing cardiovascular health. The body has a defence system in place to combat such harmful effects, but it requires a precise balance between inhibitory neurotransmitters like GABA and excitatory neurotransmitters such as glutamate. Unfortunately, imbalances between GABA and glutamate can occur in which case additional intake of GABA may be necessary in order to restore the right balance and thus combat stress and anxiety. In addition, a number of studies have demonstrated the sedative and anxiolytic effects of GABA at a cellular level. Also known as vitamin B3, niacin plays a role in many of the body’s metabolic processes. It acts as a precursor of nicotinamide adenine dinucleotide (NAD+), a molecule involved in the metabolism of carbohydrates, fats and proteins. Scientific studies have shown that niacin has a potential anti-cholesterol effect and may thus offer benefits against hyperlipidaemia by lowering blood lipid levels. It has also been studied for its vasodilatory effects and it is indeed this role in blood vessel dilation which most interested the Russian scientists responsible for developing picamilon. In addition, research suggests niacin may play a major role in regulating stress-related hormones. Suffice to say that niacin offers considerable benefits for fighting the harmful effects of stress and anxiety. In combining the properties of GABA and niacin, the Russian scientists have produced a comprehensive solution to fighting the effects of stress and anxiety. The result of many years’ research, this new nutraceutical is now available from the Supersmart on-line catalogue. It is offered at a suggested dose of one to two capsules, to be taken between one and three times a day, although this dose can be adjusted to your needs and the advice of your therapist. Regardless, picamilon should not be taken at the same time as other vasodilators such as Ginkgo biloba or vinpocetine. Each vegetarian capsule provides 50 mg picamilon which chemically combines a molecule of niacin (vitamin B3) with a molecule of gamma-aminobutyric acid (GABA). Take one or two capsules, between one and three times a day, as required, or as advised by your therapist. Warning: High doses of picamilon should not be used in combination with other vasodilators such as Ginkgo biloba or vinpocetine.